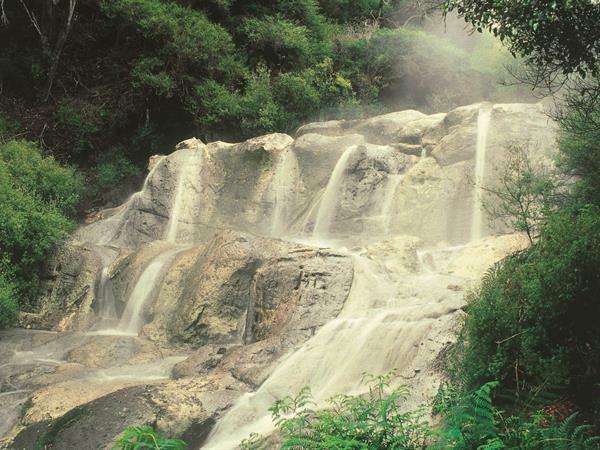 Hells Gate geothermal attraction is Rotorua's most active geothermal park and is known as the"AWESOME BEAST" of New Zealand Geothermal attractions. Hells Gate geothermal attraction features boiling hot pools and erupting waters with temperatures in excess of 100 degrees Celsius; steaming fumaroles; hot water lakes; sulphur crystals and deposits; New Zealand's largest active mud volcano; Southern Hemisphere's largest hot water fall and even examples of land coral. See, feel and understand the awe of Irish Playwright, George Bernard Shaw as he gazed upon the land and gave it the English name "Hellsgate" as he believed he had arrived at the gates to Hell. A primeval setting displaying the awesome RAW POWER of the earth and its geothermal nature.